The two leading Indian-Americans in the Republican party -- Bobby Jindal and Nikki Haley -- are not on the list of speakers at the Republican National Convention which would culminate on Thursday with the formal nomination of Donald Trump as the party's presidential candidate. Once a leading star of the party, former Governor of Louisiana Bobby Jindal, who was a sharpest critic of Trump as the presidential primary candidate, is not among the list of speakers invited to attend the GOP convention. 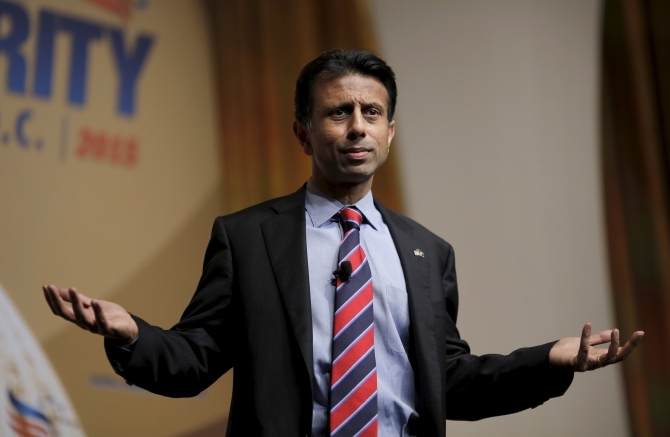 Jindal, the two term-governor of Louisiana, who was the first Indian-American governor of an American State, has said that he would not be attending the convention. However, he plans to vote for Trump in the November general election being a dedicated party member. South Carolina Governor Haley, who is a favorite of Tea Party and considered to be a rising star of the party, has declined an invitation to speak at the Republican National Convention, her spokesperson said. Her differences with Trump is well-known. Notably she was one of the leading national speakers at the RNC Convention in Tampa in 2012. During the primaries Haley had supported Trump's two opponents. However, she would be attending the convention but maintaining a low profile. But a small contingent of Indian-Americans are attending the four-day extravaganza in various capacities. Topping the list is the RNC delegates Dr Sampat Shivangi from Mississippi, Harmeet Dhillon and Dilip Bhutani from California. Notably, Dhillon is the first vice chairman in California Republican Party history, while Dr Shivangi is now a regular feature at the RNC conventions. Young and energetic Raj Shah is attending the convention in his capacity as the heading the department of research against Democratic presidential candidate Hillary Clinton. Republican Hindu Coalition, which was formed last year, today announced that they are in attendance at the Cleveland Convention. The coalition is being led by Shalabh 'Shalli' Kumar and Abhay Patel, the GOP Senate candidate from Louisiana. "The Republican Party is the party of the future," said Kumar. "We will continue to represent the interest of Indian-Americans in the Republican Party and help advance conservative causes like free enterprise, with limited and smaller government; fiscal discipline; family values; and a firm foreign policy of strength against radical Islamic terrorism and policies that keep in mind America’s security," he said. As per a recent poll, an overwhelming majority of Indian Americans support Clinton and the Democratic party. Indian Americans have been appointed at key positions in the Democratic party and have been given key positions in the Clinton campaign.